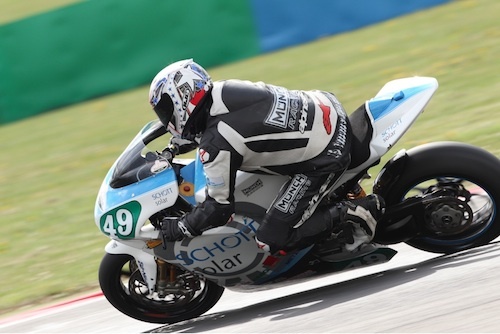 A couple weeks ago the 2012 FIM e-Power race series launched on the weekend of April 15 at Mangy-Cours. The race had a small showing of teams and unsurprisingly Meunch won the race. Meunch had not only Matthias Himmelmann riding but new team-mate Katja Poensgen. "We are very happy with the results and the felicitous season opening. The time we spent developing and testing definitely paid off," said Matthias Himmelmann. Matthias tested a new, more balanced battery and Katja competed with the most recent engine. One could see that she was really enjoying the ride. "The feeling on the bike is so much different compared to the 250's. Since you not only have to watch your competition but most of all your battery, you really have to ride tactically. The racing series may still be young but I'm already very glad to be a part of it." Meunch fielded two instances of the improved TTE 2.0, a machine weighing 220 kg powered by a battery pack of 350 V/40 Ah. Himmelmann won over his team-mate by over 30 seconds. Also appearing was Christian Armendt of EPO Racing Team. Armendt had raced in e-Power during 2010 but bowed out for 2011, and has returned for 2012 promising a wholly new bike for the June race. He specializes in ultra-light electric motorcycles hoping to get more bang for the buck speed wise. However, it is clear from the FIM writeup that he was left in the dust, but it's unclear whether he rode his 2010 bike in this race. If so it is unsurprising to see him beaten so badly, because Meunch's bike is way ahead technically from the ones they fielded during the 2010 season. A major missing figure from this race is CRP. Over the last two years CRP and Meunch have been dueling it out for the primary position in European electric motorcycle racing. Both teams had fought hard with each other in both FIM e-Power and TTXGP races in years past, so it's curious that they are skipping e-Power this year. Katja Poensgen is a former 250cc rider who bowed out of racing in 2003. She is making a comeback via electric motorcycle racing saying “I stopped riding competitively 9 years ago, then I had my daughter and I wasn’t thinking about racing again, Katja explains, but last year I was invited to test an electric bike on a TV show and I was won over. When Munch Racing invited me to ride at Magny-Cours, I said yes. The bike is fun to ride. Of course there is no noise or smell, but it is beautifully smooth and you have to use your brain much more to get a good performance than when you ride a classic bike."